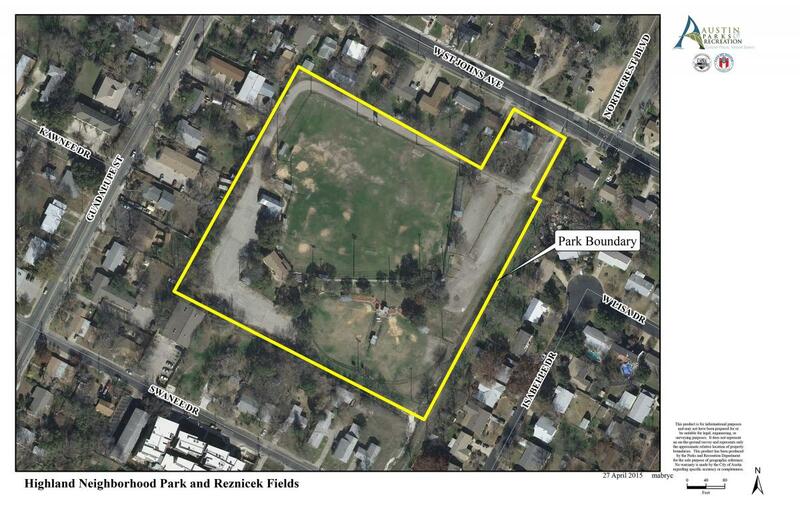 On Tuesday November 17th, PARD, together with consultants Norris Design and Asakura Robinson, held the first public input master planning meeting for Highland Neighborhood Park and Reznicek Fields. We had a large turnout with over 50 residents of all ages. A huge thank you to all our volunteers who passed out fliers in the neighborhood to spread the word! Residents were really excited about a park in walking distance and the opportunities for this site, including increasing access using the trail along Waller Creek and the shady strip of trees running through the middle of the property. Special thanks to John Lawler with Councilmember Casar’s office for his attendance and interest in the project. The chosen location – 401 W. St Johns – has been used as sports fields for several decades by the University Hills Optimists (UHO). Per the agreement between UHO and Highland, UHO will be able to continue their sports programming onsite on a 1.3 acre multi-use field that will utilize temporary fencing to allow neighborhood access when not in use by UHO. The new Highland Neighborhood Park, located centrally in Highland neighborhood, provides an amazing opportunity to have new equipment and features tailored to the wants and needs of a part of Austin severely lacking in park amenities. Everything onsite must be razed, so picture it as a blank slate and let us know what you imagine for its future! After a presentation from Robert Deegan of Norris Designs there was an open house and short survey to understand the amenities and uses the community envisions. The slides from the presentation are available HERE. The site analysis in the presentation includes details about the trees on the property, but the legend is difficult to make out. Please note that the red circled trees are heritage trees and the blue trees are high quality trees. In the analysis you will see a large blue strip of shady high quality trees running through the center of the property between the two open fields. This is the link to the SURVEY. PLEASE GO TO THE LINK AND FILL THE SURVEY OUT! It provides Norris Design with the information they need to create concepts for the park. The survey closes December 6th, so, if you want your input to be a part of the new Highland Neighborhood Park, go fill it out now! The future meeting dates will be February 10th, 2016 and March 23, 2016, location TBD. There will be a childrens’ table at the meeting, so bring your kids and let us know what they want at the park. In February Norris design will present some different concepts based upon the survey results, which should be interesting and exciting! We’ll review and give feedback on those concepts and meet again in March to review the Draft Master Plan. When you fill out the survey you can sign up for updates. You can also subscribe to the HNA park website using tabs at the top of the page to get updates from us. I’ll be speaking at the December HNA meeting so come to hear a little more about the current activity on site and future plans for the park, and stay to do a little shopping at the Blue Genie Arts Bazaar. The Marchesa Hall, host of our HNA meetings, holds this art bazaar which features local and regional artists with unique and amazing Christmas gifts, and we have the good fortune of being able to walk out of our meeting room straight into the free market. Just one week until the first of 3 master planning meetings to design our new neighborhood park! Join us Tuesday, Nov. 17th from 6:30-8 at Reilly Elementary, 405 Denson. This meeting is an amazing opportunity to give your input into an amenity that will improve the quality of life for the residents of Highland neighborhood and all of North Central Austin. We look forward to seeing you there and hearing what you envision for the future of Highland Neighborhood Park and Reznicek Fields!